Monday July 6th 1891 I did not feel very well and did not work. The men finished plowing the corn on the Stevens land. I done a little sewing. Fanny and Annabel were over to bid us good bye as they go to Marshalltown tomorrow. Tuesday July 7th 1891 The men began working hay today. I was still sewing Mother went to town to spend the day. Wednesday July 8th 1891 We washed this forenoon and ironed in the afternoon. Anna Gilbert and Maud came on the train from the east this morning for a long visit. Mother and Father went over to Hatties to stay a week. After supper Will took us girls over town in the Surry. Thursday July 9th 1891 I was doing some baking this morning and the girls done a lot of washing for themsevles. In the afternoon Will hitched Nell to the Surry and Mr Able drove us girls over to town and back. We spent the evening at home. Will is working in the hay. Friday July 10th 1891 The girls done their ironing this morning and then went over to Esthers to spend the day. I got the dinner nearly ready and Father come and took me down to Holsons to dinner. I came home in time to do my evening work. Will and the men put in 14 loads of hay and after supper we rode to town. Saturday July 11th 1891 I was all the forenoon doing baking and making jelly. I was sewing on Wills shirts all afternoon. The girls were in town awhile. We all rode to town in the evening. Will was working in the hay in the afternoon. 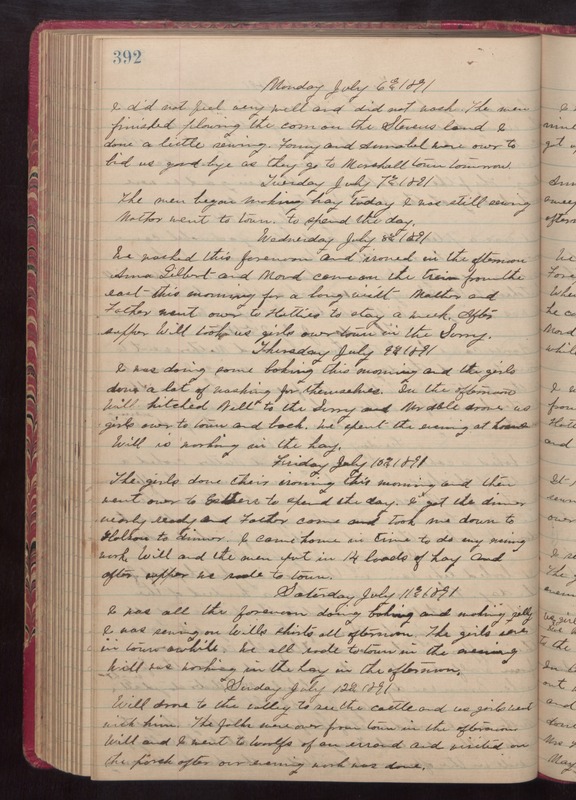 Sunday July 12th 1891 Will drove to the valley to see the cattle and us girls went wiht him. The folks were over from town in the afternoon. Will and I went to Woolfs of an errand and visited on the porch after our evening work was done.